Effective agricultural zoning, also known as agricultural preservation zoning, is a land management tool that encourages farming while discouraging non-agricultural land uses that are incompatible with farm operations. This form of zoning promotes agriculture uses and structures while limiting the number of non-farm uses such as dwellings and other activities that can compete for productive farmland. This tool is most effective when it is used to protect areas where the local agricultural dominates the landscape and economy. Effective agricultural zoning is most appropriately used in the rural and agricultural landscapes, as well as in portions of natural landscapes that are being farmed. Conserves current and future energy use by promoting agricultural activities near markets and reducing transportation expense, as well as by limiting suburban sprawl by preserving farmlands. May reduce the interest in or capacity for landowners to secure Agricultural Easements. The municipality's policy statement should be explicit about protection of agricultural lands, resources and uses, not simply "rural areas" or other less specific language. Farms should not be regarded as holding areas for future development, but should be considered to be fully-developed as the "highest and best use". Municipalities should ensure that there are adequate areas available for non-farm development in other areas to meet "fair share" housing responsibilities. Agricultural zoning policies should be created with the help of farmers. Agricultural areas on prime soils should be zoned to permit a wide range of normal and customary farming activities, supplemental farm businesses, and other compatible activities. Non-farm land uses should be strictly limited because of the inherent conflicts between these activities. All zoning ordinances should be supported by the comprehensive plan and objective data. Mapping that identifies agricultural areas and prime agricultural soils. Non-farm residential developments are separated from the effective agricultural zone by physical distance, because routine agricultural practices can have effects that can cause odors, dust or noise to travel over lot lines. Most effective agricultural zoning ordinances permit limited non-agricultural developments at a ratio of one non-farm lot per 10-25 acres or 1-3 lots on an annual basis with a maximum limit. Ordinances encourage the retention of large agricultural tracts to maximize the efficient use of land. The minimum lot or parent tract size is typically 10-50 acres. Non-agricultural lots are as small as possible and are located on the least-productive soil classes to limit their effects on the adjacent farm. Some ordinances allow the use of sewage easements that extend past the non-farm lot and into the farm area. Farm operations are considered to avoid small islands of agricultural activities are avoided. Regulations discourage the creation of "farmettes" or "gentlemen's farms" because small farms typically are not suited for long-term commercial agriculture. Regulations avoid allowing non-farm activities that are incompatible with agriculture such as retail uses or activities that create significant areas of impervious surfaces or traffic generation. Activities that support agriculture such as farm equipment repair, farm stands, nutrient management or breeding consulting, and similar activities are permitted by special exception to ensure that they do not limit the potential for productive farming practices. The extent and range of non-agricultural uses within the district should be limited and should support agricultural uses and activities, and other uses should be strictly regulated. The impact of new residential uses is limited by the use of setbacks and clustering. Some municipalities limit the maximum lot size for new non-agricultural land uses. Regulations recognize that the creation of noise, odors, the application of chemicals as well as large and slow-moving machines on roadways is a part of agricultural operations. A good practice requires non-farm subdivisions to carry a map note informing prospective lot purchasers of common farming activities that could be considered as nuisances by non-farmers. The first effective agricultural zoning ordinance in Pennsylvania was adopted in York County in 1974, and other municipalities in southeast Pennsylvania have adopted their own versions since that time. Currently, Elk Township, Highland Township, Honey Brook Township, Londonderry Township, Upper Oxford Township, West Caln Township, and West Fallowfield Township in Chester County utilize effective agricultural zoning ordinances. View a sample effective agricultural zoning ordinance that may be used as a template. 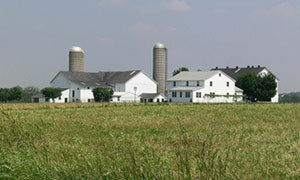 Upper Oxford Township is an example of a municipality that supports its agricultural zoning regulations with policies that are derived from its agricultural resources inventory and plan. Section 603(c)(5) of the Pennsylvania Municipalities Planning Code (Act 247) allows municipalities to adopt regulations for the "…Protection and preservation of natural and historic resources and prime agricultural land and activities." More directly, Section 603(g)(1) requires zoning ordinances to "…protect prime agricultural land and may promote the establishment of agricultural security areas."